ATLANTA, Mar. 13 /CSRwire/ - 3BL Media, the world’s leading communications partner for purpose-driven organizations, will hold the next in its series of Corporate Responsibility Stories lunch-and-learn events hosted by UPS on April 17. The event will feature Crystal Lassiter, senior director, global sustainability & environmental affairs at UPS; George Bandy, chief sustainability officer of Mohawk Industries; and Stan Little, president of the SunTrust Foundation. Dave Armon, publisher of Corporate Responsibility Magazine and chief marketing officer of 3BL Media, will act as moderator. 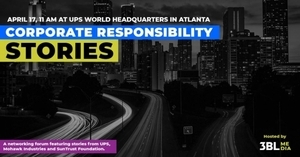 Corporate Responsibility Stories will be held from 11 a.m. to 1 p.m. at UPS’s global headquarters, 55 Glenlake Parkway NE, Atlanta. Registration is open - follow this link to register. The event is free and open to professionals focusing on environmental, social and governance (ESG) functions, including communications, marketing, employee engagement, corporate social responsibility, foundation, human resources, investor relations, community relations, public affairs, supply chain and diversity & inclusion. Crystal Lassiter: As the senior director of global sustainability & environmental affairs at UPS, Lassiter’s responsibilities include developing and driving the strategies, initiatives, and reporting activities that advance UPS’s sustainability goals. She began her career in 1996, spending most of her years at UPS in facility maintenance leading teams in engineering and facilities functions across the company’s operations. Through her experience leading facility expansions, she oversaw the implementation of natural gas fueling stations, lighting upgrades and other sustainability projects. Outside of work, Crystal loves hiking, dancing, traveling and practicing Spanish. George Bandy Jr.: In his role of chief sustainability officer at Mohawk Flooring North America, Bandy proactively identifies opportunities to position environmental, economic and socially responsible solutions for both the organization and its customers so that, together, they can demonstrate the type of sustainability leadership that will result in a brighter future for us all. He joined the Calhoun, Georgia, company in 2016 as vice president of sustainability. Previously, he held a similar post at Interface. Bandy is a past chairman of the U.S. Green Building Council Board of Directors and has been active in the organization since its founding. He is a 2018 USGBC Leadership Award recipient and was also honored with Floor Covering Weekly’s inaugural GreenStep People Award. Stan Little: As president of the SunTrust Foundation, Little leads efforts to improve the circumstances, economic mobility and financial confidence of various communities across the country. The work ranges from financial education and counseling to career readiness/workforce development and small business entrepreneurship using innovative techniques, thought leadership and new relationships to address systemic issues in new ways. Little came to the Foundation with more than 25 years of experience in various venture-backed and Fortune 100 technology companies, holding senior roles in sales, corporate development, business operations and marketing. He joined SunTrust in 2015 as senior vice president, Marketing Strategy and Operations. Previously, Little led International Marketing at NCR Corporation. 3BL Media is the world’s largest community of business leaders driving a progressive environmental and social agenda through innovation and impact. Our distribution, leadership and editorial platforms inspire and support global sustainable business.